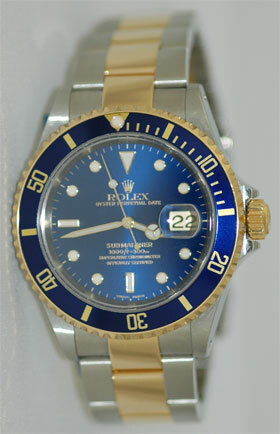 Certified Pre-owned Rolex Stainless steel and 18K Gold Submariner model 16613. Blue dial and Blue/Gold Rotating bezel and gold-through flip-lock clasp on bracelet. Excellent condition! Includes warranty and independent appraisal.